What’s complementary to backyard swingsets, commercial playground equipment, or any size flower bed? Rubber mulch! Using rubber mulch is one of the easiest and safest ways to enhance curb appeal to your yard. Rubber much makes backyard swingsets much safer because it does not absorb water or freeze like traditional mulch does. Unlike other mulches, rubber mulch doesn’t mildew, rot, or decompose. 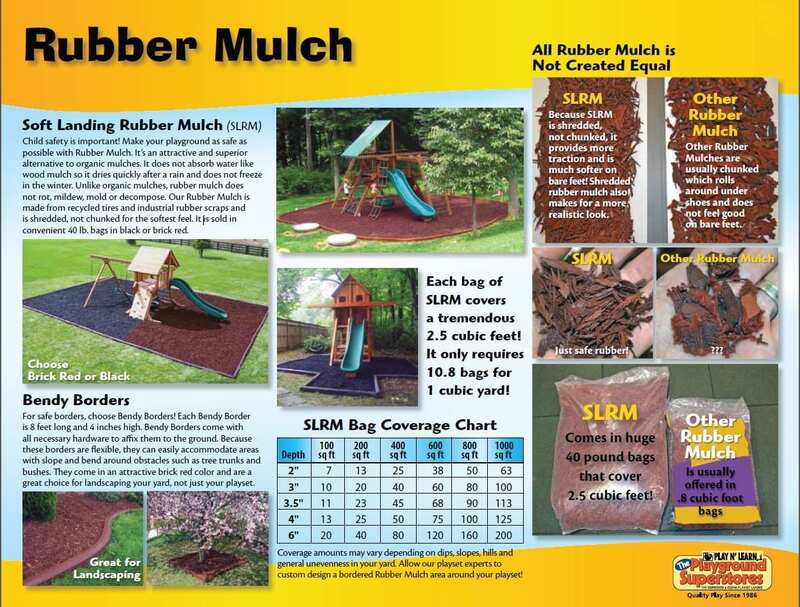 Play N’ Learn’s rubber mulch also is shredded, not chunked, making it a lot softer than other mulches. Adding a bendy border to your rubber mulch bulk order is another great investment for your yard or playground. Each border is 8 feet long and 4 inches high and includes all of the necessary hardware to affix them to the ground. These borders are flexible, making them great for areas with commercial playground equipment. 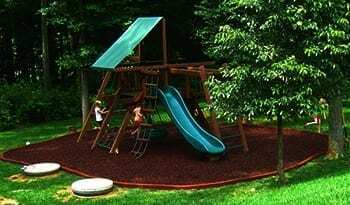 They come in a brick red color and make an attractive choice for playgrounds and landscaping alike. Coverage amounts may vary depending on dips, slopes, hills and general unevenness in your yard. 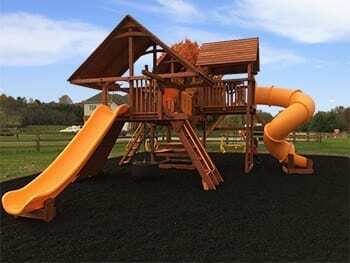 Allow our playset experts to custom design a bordered Rubber Mulch area around your playset!